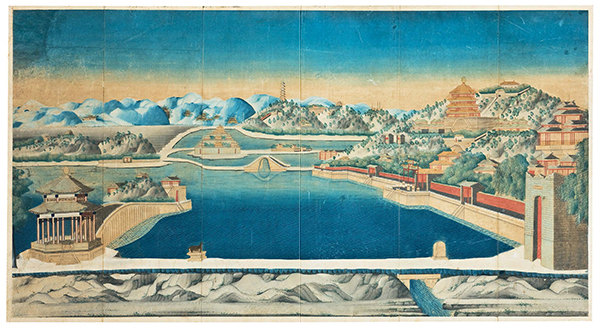 A painting in gouache on paper, composed of six vertical panels of equal width, depicting a bird’s eye view of the Yihe Yuan or Summer Palace. The perspective is taken due west and shows Kunming Lake with the Island of the Dragon King and the Seventeen Arch Bridge on the left, and Longevity Hill with the Palace complex dominated by the octagonal Fo Xiang Ge (Tower of Buddhist Incense), on the right. In the foreground is a bronze sculpture of an ox, in the middle background is Yu Quan (Jade Spring) Hill with the seven-tiered pagoda and further buildings, and the Western Hills can be seen beyond. 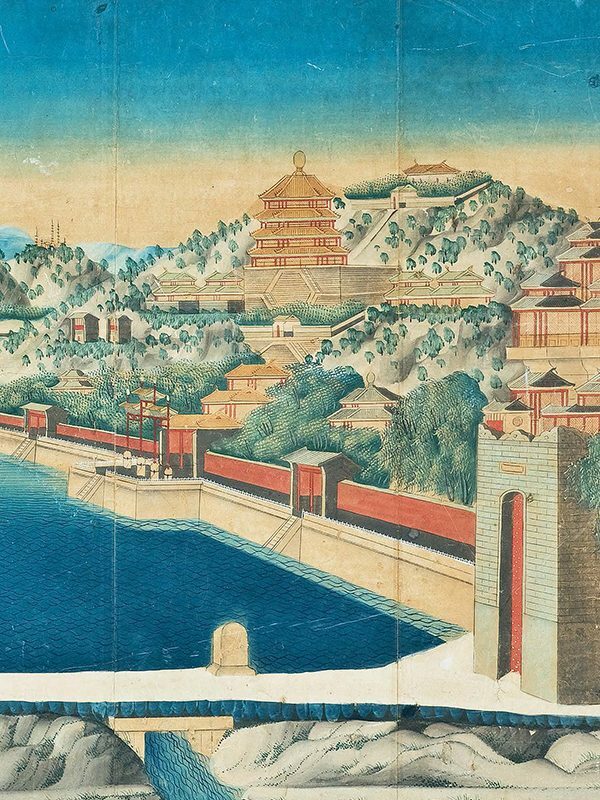 This charming landscape painting depicts the Summer Palace or Yihe Yuan (literally meaning ‘Gardens of Nurtured Harmony’), located on the outskirts of Beijing. It covers an expanse of 2.9 square kilometers, three quarters of which is water, most of which constitutes the entirely manmade Kunming Lake. In 1749, the Qianlong emperor commissioned work on the imperial gardens on the hill and in 1752 he gave Longevity Hill its present-day name in celebration of his mother’s 60th birthday. The Summer Palace started out life in 1750 as the Qingyi Yuan (Garden of Clear Ripples), when workers reproduced the garden architecture styles of various palaces in China. Kunming Lake was created by extending an existing body of water to imitate the West Lake in Hangzhou. The palace complex suffered two major foreign attacks, the first during the Anglo-French allied invasion of 1860 and the second during the Boxer Rebellion in an attack by the eight allied powers in 1900. The garden survived and was rebuilt in 1886 and in 1902. In 1888 the Summer Palace was given its current name, Yihe Yuan. During most of the 19th century it served as a summer resort for Empress Dowager Cixi (1835 – 1908). One of the most characteristic buildings of the Summer Palace today is the famous Shi Fang or Marble Boat pavilion, constructed first during the reign of Qianlong in 1755. It was destroyed by Anglo-French forces in 1860 during the second Opium War and rebuilt in 1893 at the orders of Empress Dowager Cixi. As this most recognisable of features is not present in this view and unlikely to have been left out by any painter, it can be concluded that this painting must have been produced somewhere between 1860 and 1893. The painting was once dissected evenly into six parts, probably used as a screen, and was then mounted to a complete picture as it is seen now.